Heat oven to 400°F. Heat large heavy-bottomed ovenproof skillet (such as cast iron) over medium heat 2 minutes. Meanwhile, season both sides of the chicken with salt. Add oil to heated skillet. Add chicken, skin-side-down; cook 6 to 8 minutes or until skin is golden brown. 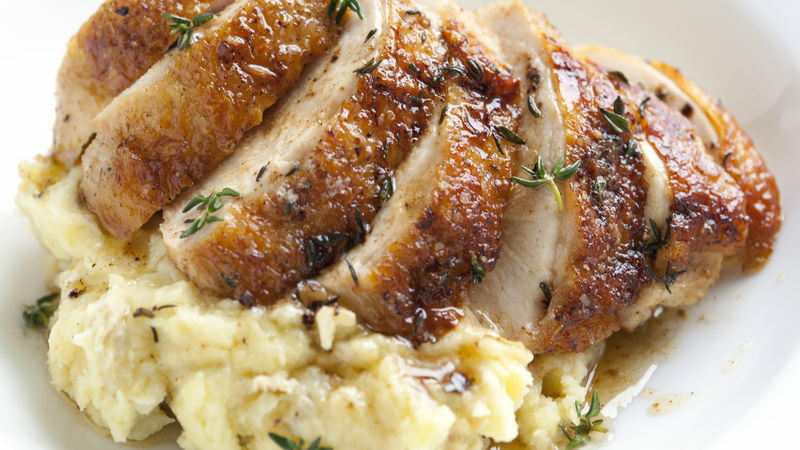 Turn chicken; add butter and thyme. When butter is melted, spoon over chicken. Place skillet in oven; bake 12 to 15 minutes or until juice of chicken is clear when center of thickest part is cut (165°F). Spoon butter over chicken. Remove from skillet to serving platter. Cover chicken with foil; let stand 5 minutes before serving. Replace fresh thyme with fresh rosemary or sage. When serving, cut chicken on the diagonal into 1/2-inch slices and drizzle a spoonful of butter from the skillet over the top.